The great guys of Backspindle Games kindly supplied us with a pre-production copy for this review. Thanks a lot! Codinca was one of the surprises for us in Essen this year, a game that none of us had heard about before that we just sat down and tried. We didn’t really have to sit to try it as the game almost doesn’t last long enough to sit, it’s an abstract game for up to four players that plays in 30 minutes or less. That we hadn’t heard about it before is not all that surprising, by the way, because the game is not easily available yet, the Backspindle Games booth in Essen had a pile of pre-production copies available, but no production copies exist yet. But if you were to catch a copy as soon as they’re available, what you would have is a game board with four by four squares and 16 tiles in four different colours to go with it. One side of each tile shows a silver symbol, the other a golden symbol. 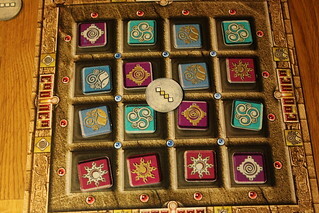 To win, each player has to fulfill four goals of putting his tiles in the right pattern and with the right side up. Each player has one straight line, one diagonal, one two by two square and one bigger square (where his tiles are the corners of a three by three or four by four square), but the tiles’ colours are random. 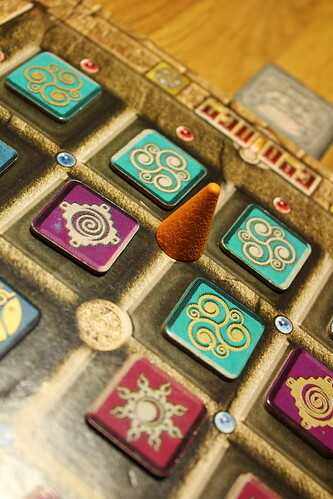 To get there, on your turn you have to take two actions: first you swap one of your tiles with one of the up to eight surrounding tiles, then you flip any of the 16 tiles on the board over from silver to gold or from gold to silver. Did anyone in the back row there just yell “But that’s too easy!”? Well, in theory it is, but you’re not the only one swapping and flipping tiles, and even when the others aren’t trying to step on your toes, there’s just not much space on the board. Even with two players, your opponent may just have to swap away one of your tiles to get his own into place. With four players, you won’t recognize the board when it’s your turn again. Getting to your goal like this would be nothing but frustrating and probably take longer than 30 minutes, too. To help you out, you have a very limited number of Luck Tokens which you can use for special actions before or after your regular turn. With the Luck Tokens you can rotate a block of four tiles by 90, 180 or 270 degrees, you can swap a pair of tiles with another pair, push a line of tiles (like in AMAZEing Labyrinth) or flip a whole line or block of tiles over. You can also use them to lock a row or block of tile which may not be moved until the start of your next turn, for a simple extra move or to undo what the player right before you did, the only move that is otherwise illegal. All those special abilities are powerful, but you only have a limited supply of Luck Tokens and no way to get more, so use them wisely. And don’t forget, the other players get Luck, too. As a final game element, each player gets one random Trap Card per game. Trap Cards are a kind of desperation move, when you turn yours over it immediately flips all tiles on the board to the silver or golden side as shown on the trap card. It’s not as powerful as the Luck Tokens, but as a last-ditch effort to keep an opponent from completing their last goal, they do come in handy. Of course, since you don’t know your own trap card before you turn it, you may just end up helping them. And that’s all the rules. You’re now ready to play. Codinca is not a complex game to learn and it’s not a difficult game to play. But don’t mistake that for being easy, because it’s still tough to win against a competent opponent. As abstract games go, Codinca is on the light end of the pool, but it’s doing good there. It’s fun, quick to explain and play, and requires enough thought to be interesting but not so much it would slow the game down. We had a lot of fun with Codinca, it’s a great game to just break out for a game or two and works for any level of player. Nothing is easy when the gods are against you. Especially not getting home across the sea when the god in question is Poseidon. And even less when Poseidon is a friend from whom you just stole the last piece of pizza. That’s the setup of Odyssey – Wrath of Poseidon: up four players are Greek navigators on their way home, one player is Poseidon who feels slighted by the Greek’s victory at Troy. Together, they play an asymmetric deduction game. Some countries just don’t manage to form a stable government, but the unnamed kingdom of Council of Four is ridiculous even by those standards. Influential merchants, the players, exchange councilmen in any way that best serves their interest. If the current council can’t be bullied into writing a business permit, they just replace them. And whoever does that best wins the game. We all have played Cops and Robbers as kids. Pretty much all of us forgot the simple joy of pointing a toy gun at our friends and yelling "Bang! Bang! You’re dead!" Cash’n’Guns skips the cops for most of the game. but the robbers and toy guns are there.